Ripon City AFC established in 1898. Early signs indicate the club played most of its pre-war matches on the Cricket Club ground. An early picture taken of the team and officials, after winning the 1907/08 Harrogate and District League, sees them displaying the trophy in the cricket pavilion. In 1918 Ripon City held its first meeting since before the war and, when play resumed, they could be seen playing on the present site at Mallorie Park. At this time only two teams existed in the city – Ripon United and Ripon City. 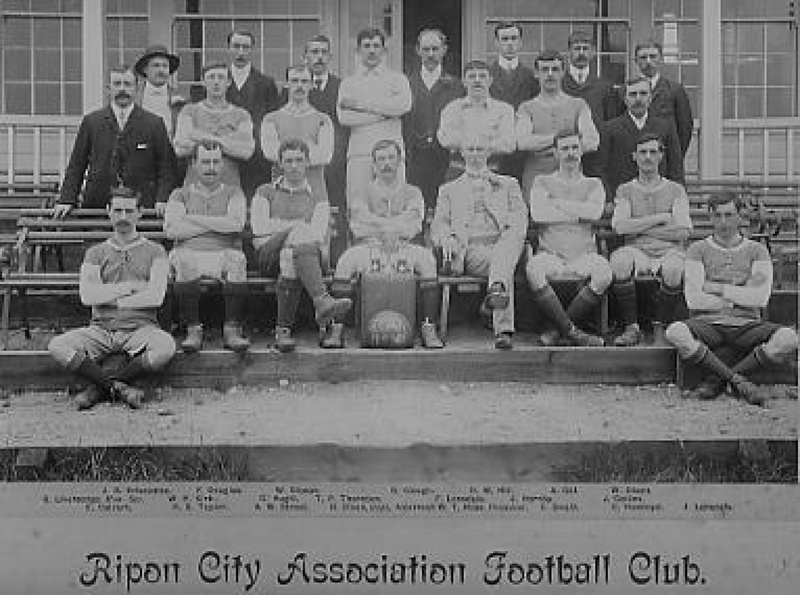 In 1919 the two clubs amalgamated and became Ripon City A.F.C. One of the first projects undertaken after this amalgamation was the erection of the stand. This was built in 1920 and is still in use today. It would seem the problems we encounter today are not new and were inherited from our predecessors. A report in August 1935 stated the club was in danger of closing if members did not show more commitment and gate receipts were increased. With this in mind, after twelve years service, the club left the York & District League and entered the Allertonshire League in an effort to boost gate revenue. Fortunes did indeed seem to change and the 1940’s saw the club to be much improved. In the early 1950’s Ripon were a formidable force and in his autobiography Harold ‘Dickie’ Bird recalls his father playing for Barnsley F.C and beating Ripon City 1-0 in the Yorkshire Trophy Final at Oakwell. 1958 saw Ripon City win both the Ripon League Senior and Junior Charity cups as well as reaching the final of both the Whitworth and Hulme cup. In May 1962 a decision was taken to purchase the present ground at Mallorie Park. In August 1977 Harrogate District Council approved plans for a new clubhouse and changing rooms both of which remain in use today. However in 1981, the rapid growth of the club saw plans for a new shower block approved and these still remain one of the finest in our leagues. At this time Ripon had an abundance of local football teams. One such team was Ripon Y.M.C.A. who went on to become known as Ripon Yorkshire Magnets AFC. This team was to become one of the most successful local teams of that time and in July 1990 an amalgamation took place between Ripon City and Yorkshire Magnets. With the onset of the 1991/92 season the name of the club changed to Ripon City Magnets a name that took us into our centenary year and beyond. So what of the future for Ripon City AFC? The influence of Television, Video and Computer seems to have heralded the demise of park football among our youth and this could have an affect on future progress. In May 2006 the club were awarded The FA Charter Standard which will enable the club to strive for a higher standard of football in the future. In 2016 the club has gained Community Amateur Sports Club (CASC) status which will enables the club to continue its commitment to local grassroots football. The committee and volunteers are working hard to improve the facilities on and off the pitch down at Mallorie Park, with the ultimate aim of building a new club house to serve the next generations of Ripon footballers.